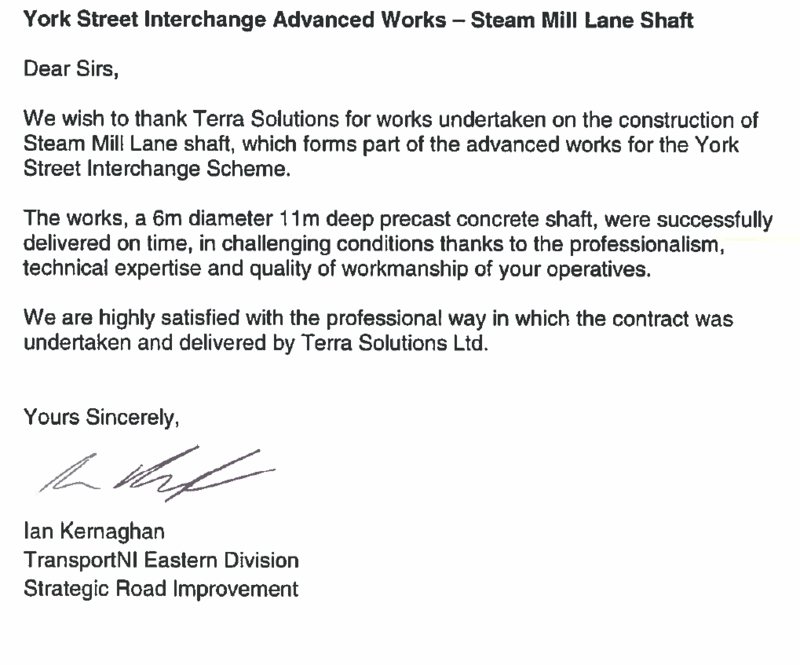 Terra Solutions were engaged to construct- through shaft sinking- a shaft of diameter 6m diameter that would be 12m deep on Steam Mill Lane, Belfast. This shaft was to serve as a storm chamber as part of the larger York Street Interchange Project in Belfast, which was ongoing. Requiring a UXO (Unexploded Ordinance) survey, and with adverse weather conditions, located underneath a road bridge with height restrictions, this project clearly had more than its fair share of issues. That the shaft was also to be sunk “wet,” meaning it would have to be excavated while full of tidal water, further complicated the procedure, we needed to hire some dump trucks in order to get the residues out. This was necessary as the groundwater level was very high, approx. 1.2m BGL (below ground level). The whole site was situated in an existing car park, so a traffic management plan had to be drawn up and implemented. 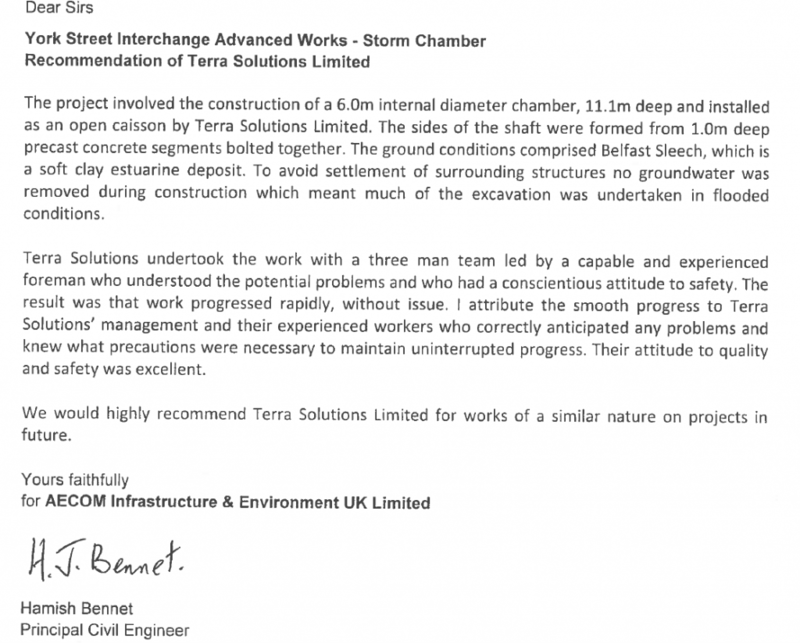 Luckily Terra Solutions are the Trenchless Experts and have tackled many challenging projects in the past and know that effective planning can counteract potential issues before they ever become problems. In preparation for the UXO survey, site perimeter fences were erected and appropriate safety/warning signage was posted. With Belfast being bombed relatively heavily during WW2, there was a risk of unexploded ordinance being discovered. A third party had to be engaged to carry out the UXO survey, and Terra Solutions were only certified to supervise their activities. The Terra excavator was at hand to remove any shallow obstructions. Thankfully this passed without incident. A hole of sufficient size to accommodate the rings and concrete collar was excavated and the cutter choker and first ring were then built into place. The choker and rings were wrapped in polystyrene, so as to create an annulus, so the rings could sink under their own weight, independent of the collar. For this project, the collar that was to be constructed from reinforced concrete so the Terra Team hand tied a frame around the first ring. Next the collar was poured (in this instance the collar was 1000mm x 2000mm), and rails were put in place as a safeguard against people on the surface falling in. At this point, threaded bars were also installed in the wet concrete, so that hydraulic jacking rams could be used to assist with the process. From here, the ground within the shaft was excavated in a controlled and methodical manner, so that no one area was excavated much more than any other, keeping everything uniform. As the ground was removed and the shaft began to sink, the rings (made up of 8 pre cast concrete segments each) continued to be built on top until the required depth (12m) was reached. The Caisson method allowed us to sink the shaft so far under its own weight, but eventually there was a change in the ground conditions (as indicated by borehole testing) to a stiffer type of clay. 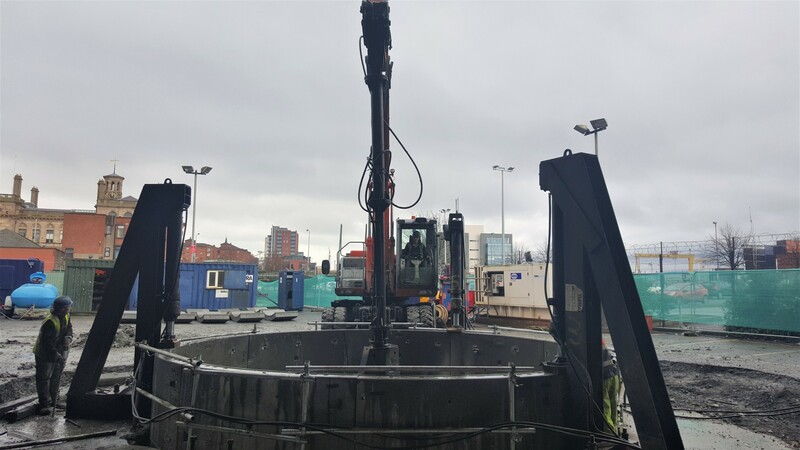 To reach the required depth of 12m, we employed three hydraulic jacking rams to jack the shaft down to its final depth. Working as we were underneath a bridge, there was a maximum headroom limit in place on the site, so this made it necessary to develop a plan for how the excavator with clamshell attached could move around the site and access the shaft. Luckily, Terra had encountered problems like this before and knew how to adapt. Creating this traffic management plan was essential due to the “wet” nature of this excavation- i.e. there was no dewatering, so all excavation had to be carried out by machine. The annulus between the shaft rings and the ground required lubrication to reduce the frictional forces acting on the shaft. The lubricant used was bentonite based, and this was mixed in a paddle mixer and then pumped in to the annulus, facilitating easier movement of the shaft through the earth. The next step once required depth was achieved was to install the base plug underwater, a set of recessed segments had been installed above the cutter/choker this provided an anchor point for the plug to tie into minimising the chance of ‘blowing’ when the water was pumped out. The underwater setting concrete was pumped 12m below ground using a 32m truck mounted rig, the pour was constantly monitored to ensure the correct levels were achieved. The plug was left to cure for 7 days and then pumped out leaving a shaft carcass with little to no infiltration. 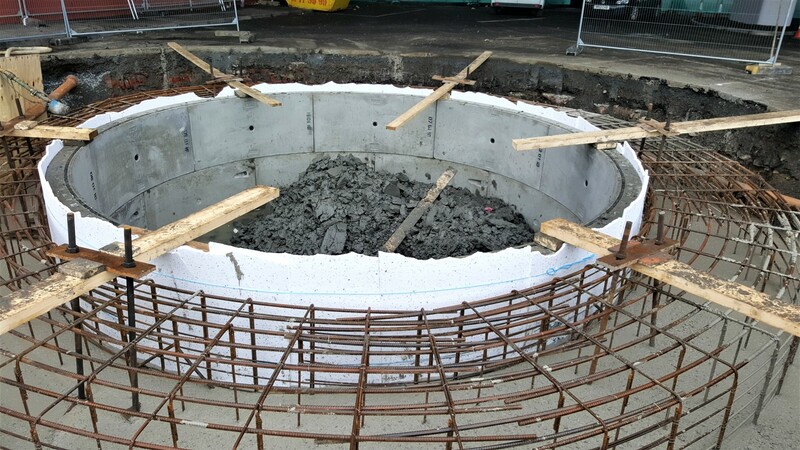 This provided a dry working area to install the reinforced concrete base on top of the plug. The steel for this was hand tied, including dowel rods which attached to the shaft lining, then the concrete was placed using a tremie skip and a floated finish applied. 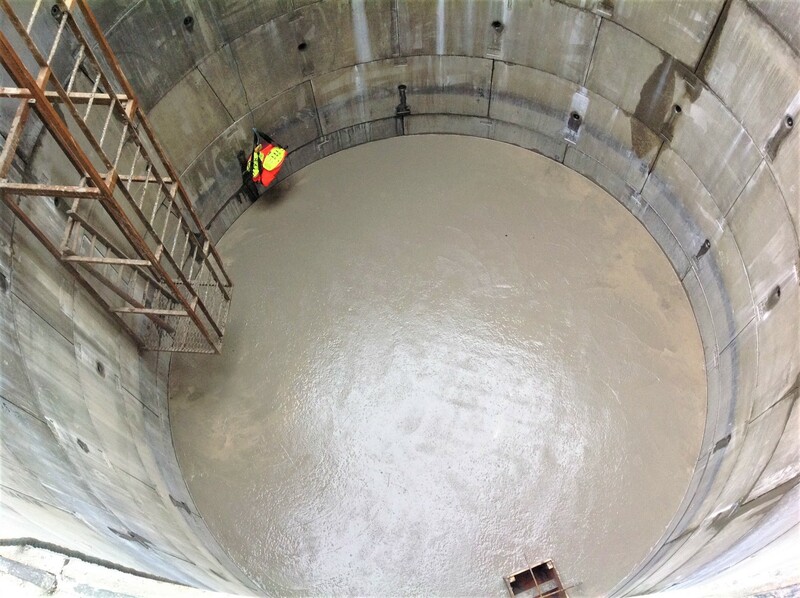 With the base concrete poured, the walls and the base constitute one single structure, and all appropriate grout was applied, making a permanent barrier between the shaft and the ground around it. This was pumped in using the same pump as was used for the bentonite, and the denser grout displaces the bentonite from the annulus. For its intended purpose, this shaft needed a smooth interior, so the walls and base had to be caulked and pointed. This was carried out by a member of the Terra Team in a man-riding basket attached to a mobile crane. This team member was required to wear a harness which was attached to a davit arm at all times. Finally, arriving in 5 pieces, the cover slab could be installed. The heaviest of these sections weighed 10T, and was set into place by the 90T mobile crane. Find our other Shaft Sinking projects here. © 2019 Terra Solutions. All Rights Reserved.